Chelsea are set find out whether two consecutive domestic losses are the start of a slump or merely an aberration when they play at Racing Genk in the Champions League on tomorrow. 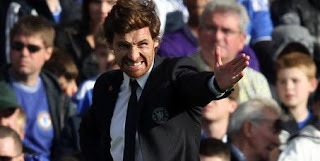 A win would put Chelsea back on track and ensure the two Premier League defeats, against local rivals QPR and Arsenal, are not necessarily a fundamental issue for new manager Andre Villas-Boas. A third straight loss, however, would undermine the team's lead in Group E of the Champions League and could be the start of a crisis at one of Europe's leading clubs. Nothing short of a win is paramount for the Blues before the daggers are drawn. Backed by a 5-0 home win over KRC Genk on October 19, Villas-Boas refuses to be flustered. "In the Champions League, the scenario is another one," he said. "We can get in a very good position if we win the game. We have a chance of qualifying if Leverkusen wins." Chelsea lead the group by one point from Bayer Leverkusen. Valencia is five points off the pace and Belgian champions Genk have only a single point. Leverkusen travels to Valencia in the other group match. There are two more group rounds are left after Tuesday's games. On top of Chelsea's poor results, eyes will also center on John Terry. The captain faces an FA investigation centering on allegations he directed a racial slur at QPR defender Anton Ferdinand during a 1-0 loss last week. Suddenly facing pressure from all sides, Chelsea will have to prove that two bad weeks in football doesn't make a critical difference and that its defense has only lapsed momentarily. The west Londoners were all over Genk two weeks ago with a spate of early goals and Fernando Torres leading Chelsea in equalling its biggest ever win in the Champions League. Conceding five at home against bitter rivals Arsenal at the weekend, though, wiped that happy memory off every fan's mind. It left Chelsea third in the Premier League standings but facing a nine-point gap from in-form leaders Manchester City. The swing in fortunes and momentum compared to Genk could hardly be bigger. If Chelsea fell hard against Arsenal, Genk dragged itself out of a crisis against FC Brugge that same Saturday. Trailing 4-2 with 17 minutes to go, the team scored 3 times for a 5-4 victory which eased the pressure on coach Mario Been after a bad month of October. The reigning champions are still back in sixth place, 10 points behind leaders Anderlecht.